Download GSM Aladdin: Being an incredible yet super easy Application for Windows Computer and laptop, GSM Aladdin is an Application that is helpful for the Mediatek Supported Device users. If you wish to get yourself a helping hand in repairing, user code finds, Null or invalid IMEI, flashing, etc in your Android or even feature phones, you can do all and more of it with the help of GSM Aladdin. This is one of the best tools with a user-friendly interface and comes with easy methods to achieve a certain task. Before getting into the actual procedure of downloading and installing the GSM Aladdin tool, let us first see what it actually means. 1 What is GSM Aladdin? 3 How to install GSM Aladdin Application? GSM Aladdin V2 1.34 is an application developed by the Infinity Box.com that allows you access to flash a number of features on your Smartphones, tablets and even feature phones! This application is compatible with almost all the Windows-based computers. The area of work depends on the chipset of that particular device which decides what features you can use on it. 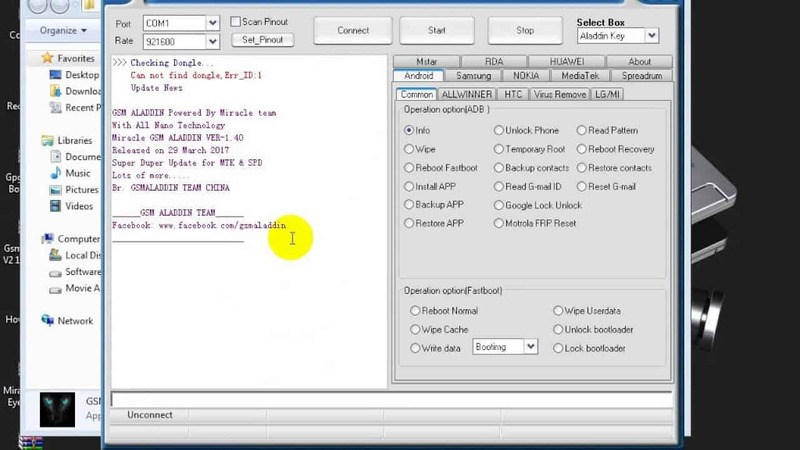 The devices that run on the Spreadtrum chipset can flash the stock firmware file, Repair any IMEI issues existing on your device getting your number back, read the user pattern code, format the device and read and write the NV. The devices that have a Mediatek support that is the devices that run on a MediaTek chipset can read the pattern code, repair sort of Wi-Fi issues you may be facing, back up the data on the device like contacts, logs, etc files. The most amazing thing that I personally got attracted to was that you can also restore the root permissions with the help of GSM Aladdin in case you wish to root the Android operating system of your device. With this, you get to have many more advantages of using this app as- Clearing the settings, Bypassing the Factory reset Protection, Network unlock the device, Direct clear the password, Format the device safely, Reset the user lock and a lot more. Tools For You: Download Android Multi Tool and Download Mi Account Unlock Tool. ~The GSM Aladdin Application is compatible with any Windows Based Operating system. That includes- Windows XP, Windows Vista, Windows 7, Windows 8, Windows 8.1, Windows 10. ~Do remember to have a back up of your current data on your device before using the GSM Aladdin app so that you can always use it later on by restoring. Do not forget to download and install the tool on your main C:// Drive. How to install GSM Aladdin Application? Step 1: After having downloaded the GSM Aladdin application by clicking the download button above, open the GSM Aladdin zip file. Step 2: Now, install the .exe file and you are done here, Soon the Application will be installed and you can use it. IMEI Support on MT6795, on Nougat. Unlock or disable Samsung Lock. Read pattern lock of any android device. Unlock, reset or read password of Nokia Phones. Read, Write and Format IMEI number. So, guys, this was it about GSM Aladdin tool. Hope you guys found the article of use. In case you have any doubts or queries, you can let us know in the comment section below. We will be glad to help you out. Keep visiting our page- Android Jungles for more such articles or you can also subscribe to our newsletter to receive timely notifications of our posts.